Snrky: That's an improvement from doing the wrong things. That's an improvement from doing the wrong things. I'd never heard of parity items until someone used it in a meeting the other day. Apparently it's used to refer to parity between two competing products or between two internal products that are working off the same code base but with different development teams that may want to leverage the same features. I found it a bit confusing, because I don't normally think of my product in terms of "I'd like to catch up and do that thing the other group/product is doing." I'm more of a "I wonder what it would be cool to put in our product that would really make it stand out." The idea of parity reeks of aiming for the same level. e.g. being average. Not that I don't understand it. If their product can identify individuals by their keystrokes and offer them something valuable, well then mine should too, because if it's automatic over there, and they have to go through clicks and typing over here, they're going to go over there, all other things equal. And there's the crux of it, right? "All other things equal." But I think of that in terms of basic functionality. Do we deliver client side so there's less of a wait and our response times are similar? Do we have the same or fewer clicks? Is our interface more intuitive? Is our uptime good? Is it easy to fill out a form or submit an order? Is it as visually pleasing? Those all seem like obvious gimmes not requiring a phrase like parity items. They're just a natural outcome of good web/app design. Parody items on the other hand...that should be a thing. Snarky: Parity items? I thought the PM said parody items. None of the buttons or drop downs do anything. 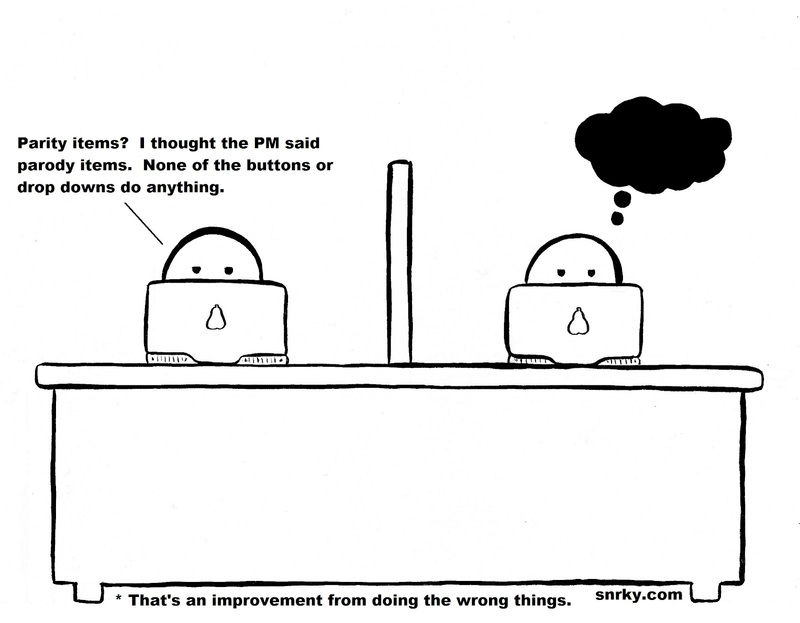 Title: That's an improvement from doing the wrong things.